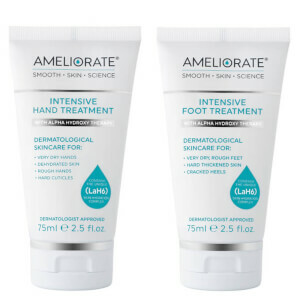 AMELIORATE Intensive Foot Treatment resurfaces the stubborn areas of hard skin whilst providing long-term relief to very dry, rough feet and cracked heels. 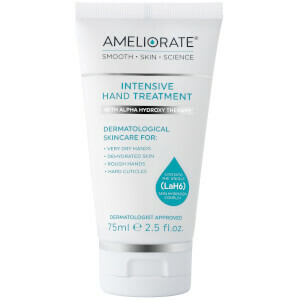 Tested on 51 people with very dry, rough, thickened feet and cracked heels. DIRECTIONS: Massage liberally into the feet and heels twice a day for 14 days. For best results apply at night, put on a pair of cotton socks and allow the treatment to work while you sleep. Reapply in the morning. Thereafter apply as needed. For surface cracks only, do not apply to broken skin. Aqua/Water/Eau, Ammonium Lactate*, Glycerin, Urea, Cetearyl Alcohol, Butyrospermum Parkii (Shea) Butter, Cera Alba/Beeswax/Cire D'abeille, Ethylhexyl Palmitate, Glyceryl Stearate, PEG-100 Stearate, PEG-8 Beeswax, Simmondsia Chinensis (Jojoba) Seed Oil, Phenoxyethanol, Sodium PCA, Sodium Polyacrylate, Sodium Benzoate, Fragrance (Parfum), Potassium Sorbate, Pentylene Glycol, Farnesol, Hydrolyzed Milk Protein, Lactic Acid, Serine, Sodium Lactate, Sorbitol, Disodium EDTA, Linalool, Citronellol, Citrus Aurantium Dulcis (Orange) Oil, Limonene, Sodium Chloride, Coumarin, Juniperus Mexicana (Cedarwood) Oil, Alpha-Isomethyl Ionone, Pelargonium Graveolens (Geranium) Oil, Geraniol, Allantoin, Sodium Hydroxide. *From Lactic Acid. Very easily absorbed into my feet and left my with very soft skin helping to get rid of any hard skin. It smelt lovely and left my feet feeling soothed. I loved this product, it absolutely transformed my feet. I will recommend it to all my friends! The improvement to my feet was amazing! I loved it, the smell, how soft it made my feet and how it transformed them.